Motivation is funny old thing. What is that makes you get up and go to work? In amongst the demands of family life, most of us have to insert some productive hours to generate income to fund the lifestyle of our choice. So be it. But dark winters, both meteorologically and professional with persistent bad news, take their toll. So as the days lengthen, the earth continuing to tilt on its axis, and the temperatures rise, notwithstanding the unusual nature of May snow !] you feel the burdens of winter lifting. So let the sun warm your face and raise your spirits. It makes a change from rust and frostbite! May and its adjacent months are the period of Dental Shows, and Conferences. The Dentistry Show in Birmingham, an acclaimed success, despite the fact that only 5% of the registrant population attend. Then the BDA Conference in Manchester takes place at the end of May and the LDC Conference 2 weeks later, in Manchester too. The Scots LDC Conference took place at the end of April. These events are a chance to catch up, network with colleagues, and begin to feel good about your profession. Feel the draw of the latest technologies and equipment, dream, perhaps plan, the next big step in your professional life. It’s not too late to drop into the BDA Conference and call your Representatives to account. 130 Sessions over 3 days. The link is below. Manchester in May? Blazing sunshine, darling. If you have not been, give it some thought. Motivate yourself. Motivation in its widest sense might mean, for example, that past misdemeanours of our lead regulator fade into a forgiving memory. Sadly recent events mean I cannot avoid mention our old muckers, the "Wimpole Street Stasi". Spare a thought for the situation of our colleague Dr David Lee, whose wellbeing and reputation have been unnecessarily tested to breaking point by an FtP Hearing at the GDC which was not just thrown out, but was found so wanting that there was NO CASE TO ANSWER. In other words the GDC simply drove an FtP case on a spurious basis. I urge you to read the hearing while you can, and gasp in anger and sympathy that such events can even be commenced, let alone taken to this £1/4M expensive debacle. The GDC Chairman, Dr William Moyes, has only last week had the gall to stand up at the Scottish LDCs meeting [linked here to a GDPUK thread] and state that he is not resigning because, in essence he is part of “The Solution”. So much for accountability for his Councils distinct lack of proper oversight. Dr Moyes may be part of some perverse Final Solution but I am not sure that is part of what he has in mind. For me and my colleagues such as Dr Keith Hayes it is a motivating feeling to think that Dr Moyes is still in post and still does not get it. Time for a Spring clean? So does motivation really increases your capacity to forgive or does it merely allow you to feel justified in moving on in respect of matters about which, in truth, you can do little? “Whatever, no worries” becomes your daily Gallic shrug. It’s sunny and the days are long, do I care? The perils of the all new, singing and dancing Government computerised support in the form of Compass is just ‘one of those things’. Oh for a paper FP17 – oh wait they have changed them, slotted in some extra data collection but failed to print them in time. Online advice on their filling-in is there – but no FP17 other than a sample version! So use the old ones for now – which Compass of course cannot process properly! The stories of struggles with Compass are now becoming more than irritating – it is beginning to feel like the software has not been properly specified and it may, if the present shambles is anything to go be, be at least one financial year before all the errors and omissions are corrected. Indeed, Compass and its pointed failures have been a feature a long thread on GDP UK recently if you have not read it. Meanwhile, if you are spinning your Compass to see which way it points, Good Luck! You are not alone… This was a Government Spring Clean which does not appear to have worked well. On the other hand, compliance is never an easy activity. Let’s face it we are all dragged to the altar screaming. The CQC, in particular now they have Dr John Milne in a leading role, barely a year after his Chair of the BDAs GDPC ceased, are actually evolving fast and well and now leading the future of Regulation in the wider sense. Not only are their processes actually evolving fast and being targeted where needed, but they are dragging all the regulatory participants to the table to sort out who does what. They are to be congratulated for their initiative, “The Future of Dental Service Regulation” a punchy, pleasantly brief document that has great potential to change dentistry for the better. Read it here. You can take part – so go to the links and get your say in. It will make you feel better. 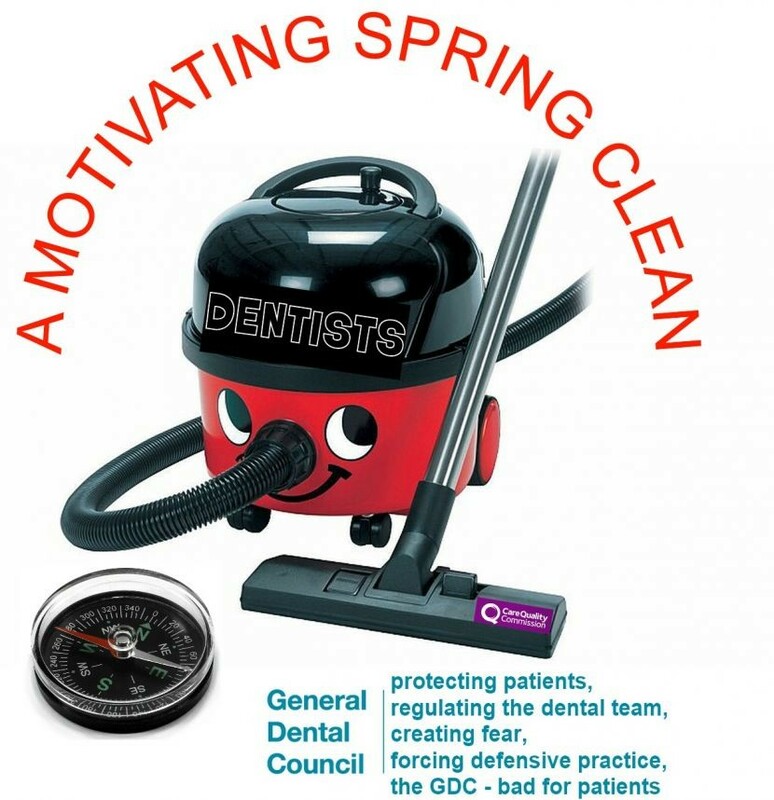 The CQC are looking increasingly like an effective strategic ally of the Dental Profession, with scope to act where the Professional Services Authority [PSA] lack the teeth. The weather? Yeah, motivating, isn’t it? Good job everything else in life is a motivating force for good. It seems that some of the leading agencies upon which we depend could do with a Spring Clean.